All members of the Monitoring Team participate in all aspects of the work, but they each have a special responsibility for a particular element within the program. Elahavelo was born and raised in the village of Analafaly, 04 km from the Reserve. He completed the 8th grade in school. Elahavelo’s encyclopedic knowledge of and interest in plants made him an obvious member of the Monitoring Team from the outset, and a clear choice to lead the plant monitoring effort. Since 1995, Elahavelo has steadily expanded our knowledge of plant diversity in the Bezà Mahafaly Special Reserve and monitored cycles of leaf, flower and fruit production. He has also been the driving force behind the creation of the Museum’s herbarium and botanical garden. Enafa was born and raised in Analafaly. 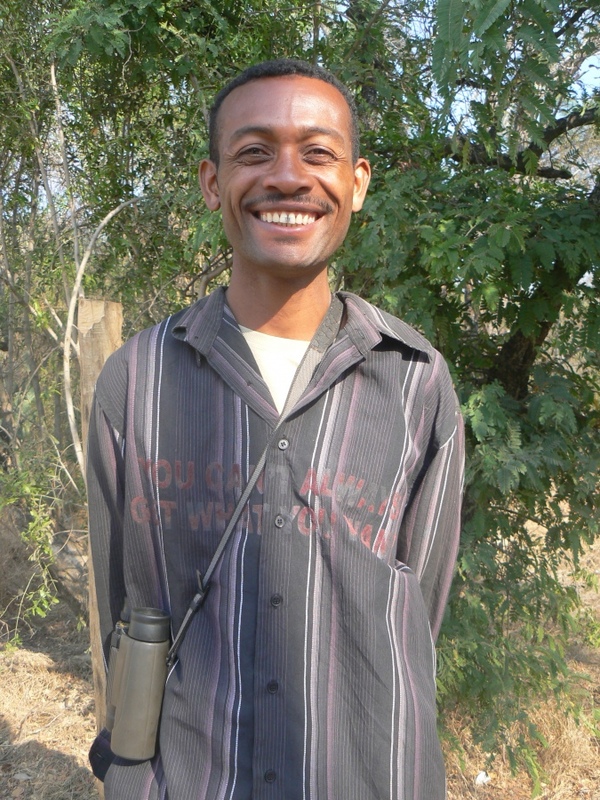 Today he lives in Mahazoarivo, a village located at 2 km north of the Reserve. He has no formal schooling but has learned to read and write since joining the Monitoring Team in 1995. 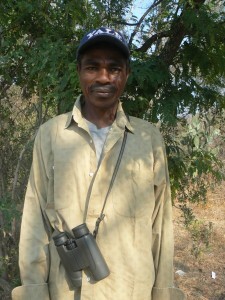 Enafa leads the lemur monitoring and censusing program, and he is also an expert with the blow gun. 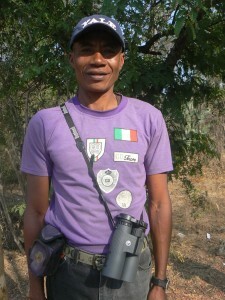 He is responsible for all the darting in the capture/release program for the two diurnal lemur populations. His prowess is well known throughout Madagascar, and he has traveled widely, helping other research teams. Efitiria was born in Mahazoarivo. He is well respected by villagers in Mahazoarivo as he used to be the Head of the Fokontany of the Mahazoarivo village, although he has not had any formal school education. 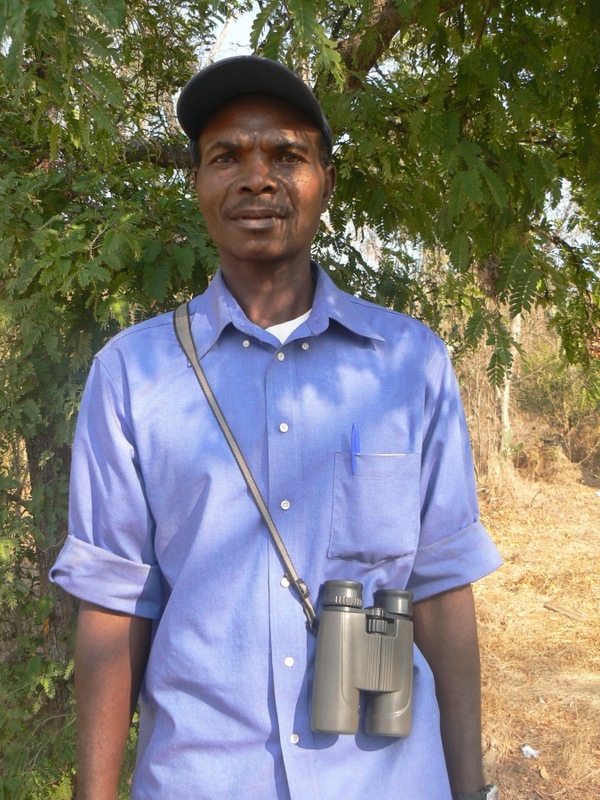 He is responsible for monitoring reptiles and birds in the Reserve. Efitiria easily recognizes and imitates bird calls and easily gets bird responses to his calls. Edouard has a baccalaureate degree, and is in charge of updating and maintaining the database on the ground. He is from Betioky, but his wife comes from the area. He is leading the socio-economic surveys and has established very close relationships with village leaders surrounding Bezà Mahafaly. Sibien is the Head of the Research Center at Bezà Mahafaly, and the leader of the monitoring team since June 2014. He has a DEA degree in Biodiversity and Environment from the Faculty of Sciences of the University of Toliary, with an expertise in natural resources management and restoration of degraded habitats in the Mahafaly plateau of the southwest. Sibien has had a lot of experience in working with the local community in the southwestern region from the district of Ampanihy to Morombe. He also has extensive knowledge and experience in conducting socio-economic surveys and biodiversity monitoring.